• Ever higher reliability and residual value. • Prompt, efficient assistance at affordable prices. ​The IVECO CUSTOMER CENTRE is available 24/7. Thanks to IVECONNECT, access to the service is now even quicker: just touch the on-board touch-screen to give the IVECO CUSTOMER CENTER the details they need to take action. When IVECO established ELEMENTS, it had one aim in mind: to provide every Customer with a repair and maintenance n assistance package tailored to their needs. ELEMENTS is therefore an extensive range of programmes for keeping your NEW STRALIS in perfect order at all times, reducing running costs and ensuring long life and high residual value for your vehicle. All at a more competitive price than ever. The long-term excellence of the Stralis's performance is assured by the use of ORIGIN 100% IVECO original parts, which are the fruit of painstaking selection of materials and suppliers, and rigorous product testing. 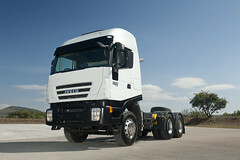 IVECO knows the value of your time. That's why it has an efficient, state-of-the-art sourcing and distribution system in the form of an integrated network of 6 warehouses in Europe, handling 350,000 original parts, and guaranteeing delivery within 24 hours, anywhere, day or night, 365 days a year. Services and assistance for trailers and semi-trailers. On the strength of its experience in long-haul transport, IVECO has selected the best suppliers in the field, and sells their products: an innovative idea that gives drivers the only real one-stop-shop for all the needs of their vehicle and trailer. An extensive, professional network for a constantly efficient vehicle. Over 3,000 IVECO dealers and workshops throughout Europe provide the peace-of-mind that comes with original parts, combined with the skills of technicians who know your vehicle like no-one else. Specialised diagnostics and repair tools such as E.A.SY. and its accessories, E.A.SY. Scope & E.A.SY. Skite, ensure quick, effective service even from a remote location (tele-services).